The unit worked well for 2 1/2 years. Then it stopped cooling. Called WE to find local service in Santa Fe – there is none. The tech support people said I needed a new control board. So I bought one and was able to remove the bad board and install the new one. The unit ran fine for 2 months and then quit cooling again. Called WE, I need another control board.It’s one thing for a unit to break down it’s quite another to be told they have no replacement parts in inventory. I had to wait 2 months for a replacement part the first time and I’m waiting once again for a replacement for the replacement part. The problem must be well known by the manufacturer as the demand for replacement parts out paces their ability to make them. On the other hand if you consider this product disposable technology with a limited useful life then there is no problem. Built-in/Freestanding: freestanding only (ambient temperature: 72°F – 78°F/23°C – 26°C), needs cc. 3″-4″ clearance around the sides, at the back and top to for proper air circulation. Noise: although branded as “Silent” but according to owners the unit is not that noiseless, especially when it cools. What’s more some reviewers reported that it becomes rather noisy after a year or so. Price range: $240 – $350 ($10 -$14.58 per bottle calculated for 24 bottles). Go to Wine Enthusiast Wine Coolers. See other Wine Refrigerator Reviews submitted by Users. 30 Bottle Wine Refrigerators – suggestions on 28-32 bottle wine bottle coolers. 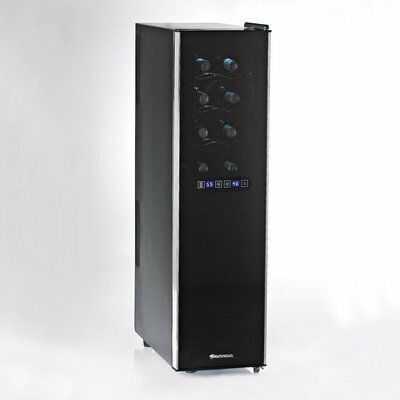 N’FINITY 23-Bottle Dual-Zone Wine Cooler – a good-quality compressor-based model by Wine Enthusiast. 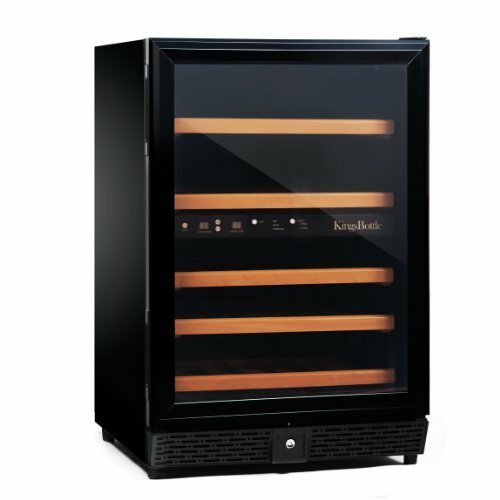 Cavavin Sobra 28-bottle Wine Cooler– a thermoelectric free standing unit with mirror door finish. 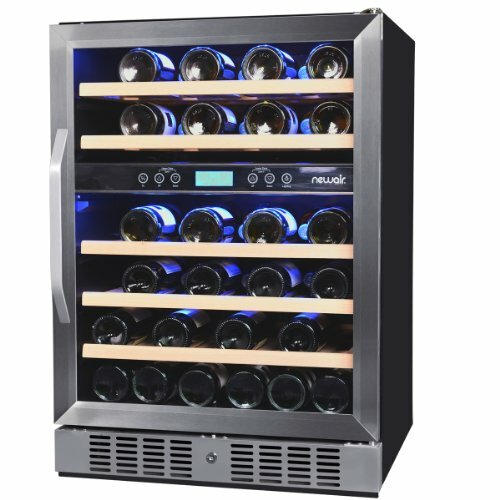 EdgeStar 28-Bottle Wine Cooler – Thermal Electric Unit with 1 temperature zone. General Electric 29-Bottle Wine Cooler – compressor operated, single zone unit. Magic Chef 30-Bottle Wine Refrigerator – compressor-based with manual thermostat. 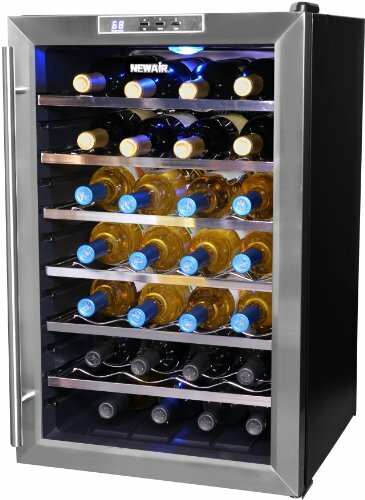 Samsung RW13EBSS wine cooler – an affordable 28-31 -Bottle electric cellar with one temp. zone. 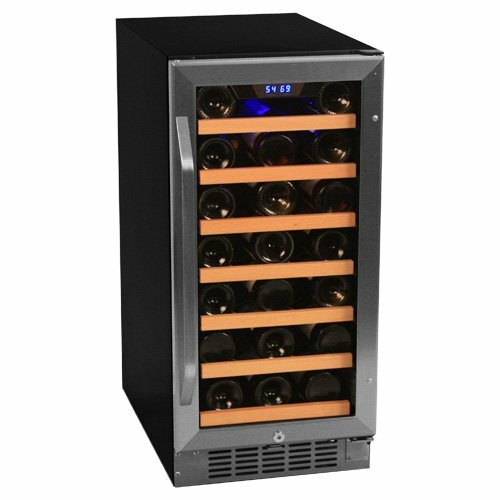 Vinotemp VT-28TEDS Wine Cooler – a 28-Bottle thermo-electric unit with digital controls and display. Standalone Wine Coolers – overview of the best-selling freestanding wine bottle coolers.